Ace marksman Kieran Watson, who is a key figure in Shirebrook Town's promotion push. The ‘sleeping giant’ that is Shirebrook Town is awakening from its temporary slumber and preparing to fulfil its potential at last. 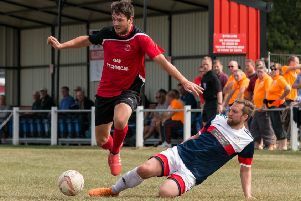 That’s the view gaining momentum among supporters at Langwith Road as Shirebrook look to put the icing on the cake of a promising season under new boss Rob Camm by gaining promotion. The club have always had the fan base and facilities to promise more. But after several seasons in the upper regions of the First Division in the Toolstation Northern Counties East League, they endured a dip in standards last term, ending up 18th. However, former player Camm has worked wonders in his first full campaign at the helm, and they now sit as high as fifth, perfectly placed to make the end-of-season promotion play-offs. “I am delighted with the way things have gone, especially as we’re still a work in progress,” said Camm, who might be only 31 but has plenty of managerial experience behind him, both at Blidworth and in Sunday football. Most of Camm’s players are aged between 18 and 21, with the potential to get better, although the two totem poles of his squad are very much captain Chris Timons and top scorer Kieran Watson. Defender Timons, who once captained Hucknall Town in an FA Trophy final, is still leading by example at the age of 43, while the 31-year-old Watson heads the league’s goals charts with 37. Camm’s revolution has brought an increase in home crowds of more than 50 per cent, and fans get the chance to see how far Shirebrook have come when they entertain tabletopping Knaresborough Town next Tuesday night.